I cut out the bottle tag with my Silhouette, then added some Crate Paper Farmhouse dp. 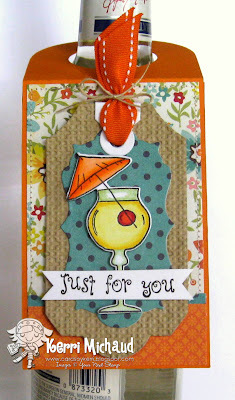 I added a Kraft tag cut with a PTI die, then added the polka dot layer that I cut with the YNS Tags Galore One Die. The fun drink is from the YNS set Cheers!, and I used one of the new Cheers! Coordinating Dies to cut it out. The sentiment is also from the Cheers! set. Ready to hear about the prizes? One lucky hopper will win a $20 YNS Gift Certificate! We also have two secret bloggers~one is giving away Cropper Fhiona, and one is giving away Shopper Fhiona to a lucky commenter! Karen also has some awesome Bundle Deals and don't forget to check the YNS Bargain Bin for the best deals on the planet! These stamps are dwindling quickly, so get them while you can! Now it's time to hop on over to Jen Roach's Fabulous Blog! Thanks for stopping by and happy hopping and shopping! Your friend is one lucky girl :) I love both your works. They are fantastic! Two wonderful projects Kerri! 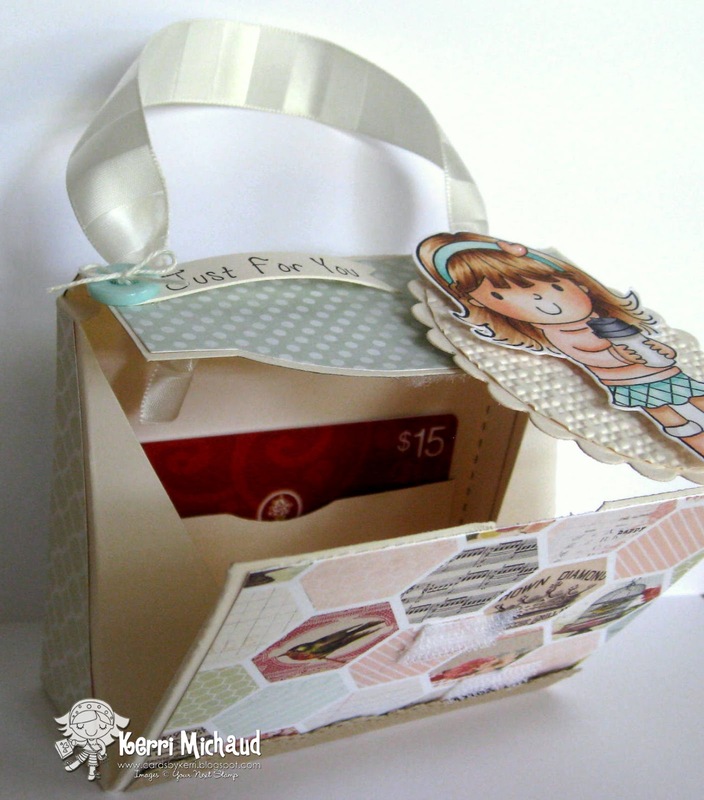 I love that purse box and the bottle tag is so fun! I absolutely adore the little latte Ellie - she is the first stamp I saw yesterday when I discovered YNS for the first time, and I know that I NEED her! The drink w/cherry is totally cute too, but I'm all in for Ellie! this is so sweet and delightful! absolutely darling!! love the fun tag! Oh she is ADORABLE! I love that little purse. The image is so sweet, and you colored it so perfectly, and the little wine bottle tag is such a great way to give a gift! That is a terrific gift card holder - your work is lovely! and the drink tag is totally fun - nice job! Kerri, wow you have outdone yourself! That gift card purse is AMAZING! THe image is perfect and perfectly coloured and I love the papers and colours you chose! Great job! The bottle tag is so sweet too! Oh my word!!! OK, I now have to have that gift card holder as that is THE cutest I have EVER EVER seen!!! and I will have to hunt down the Cheers set as I AM getting those drinkie poo dies!!! Booze and Coffee... is there anything better? Two somethings to add to my wishlist - coffee set (yay!) and that adorable bag! Fun, fun, fun! Very sweet gift card holder and fun bottle tag. Adorable little gift bag. She is so sweet, very soft and pretty feeling. Great tag for the bottle too. What a cutie! As for the cocktail tag, I'll take one of those drinks! I just LOVE your projects! You do some amazing work and your coloring is amazing! Love the bag with Elli on it- so adorable! Great projects Kerri! The gift card holder is gorgeous, fab idea. I'm loving your bottle tag too. Great project ts as always. I am in love with the new Ellie stamps. Your purse is a great project that I am going to have to try. Beautiful projects! Fabulous projects!!! Love the colors and the papers used in both! Love the purse!!!! Once again you are giving me idea - all good ones :>) I did not have time to make the basket this year, but the purse may just need to be made tonight!!! omg soooo cute! I just looove the gift Idea. I never know how to present a gift card. This is totally adorable. Fabulous projects Kerri! Love that sweet Ellie Loves Lattes gift card bag!!! Great idea for the drink stamp too!!! What a cute card...love the little girl! your bottle tag is gorgeous! Cute projects. Love the gift card holder. What a fun way to present it.